Updated 11-15-2018 --- Mod has been updated for the 1.47.49 (November 13, 2018) game patch. When I first got back to playing the game again one of the first new things I wanted to try out was the toddlers. At first, they were kind of cute and funny, but they got old and annoying extremely quickly for me. Combined with the fact that they were often buggy, I soon tired of them. I wrote this little script ages ago to eliminate them from my game in a quiet and peaceful manner so my parent Sims could sleep through the night and not have to buy a bunch of new furniture for their toddlers. I almost forgot I'd written it until I ran into it while testing mods after the Seasons game patch. Sure enough it still worked, 100% fine, and I thought maybe some other Simmers might be interested in using this. This script overrides the Python script function that determines the next age for a Sim when they age up. If it sees that the next age will be a toddler, it gets the next age a second time, so the game is fooled into skipping the toddler lifestage and ages the baby directly to a child. Because none of the game XML is modified, toddlers are still 100% functional and can be played in the game by choice. If you wish to run a household with a toddler simply use an age cheat to age the child back down to a toddler. Existing toddlers in your game will not immediately age up to a child, they will continue to play out their toddler lifestage. 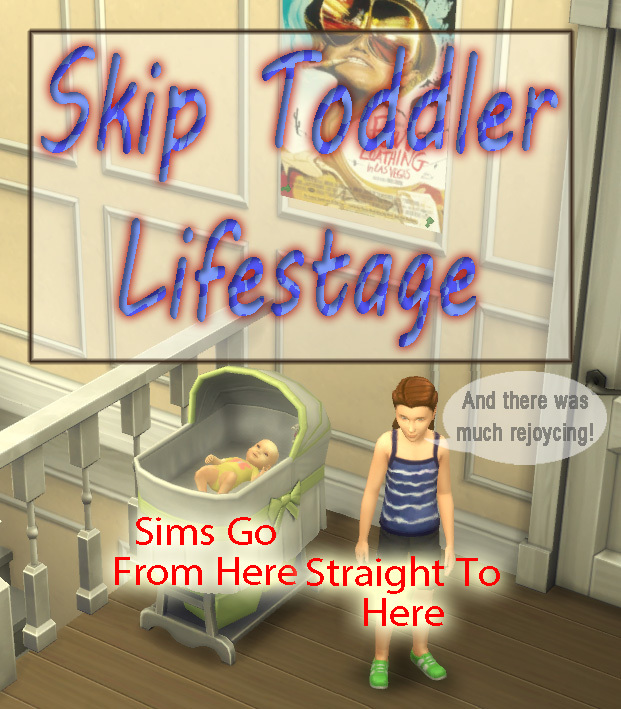 Sims which have skipped the toddler lifestage using this mod will not recieve any bonus traits from the toddler lifestage. 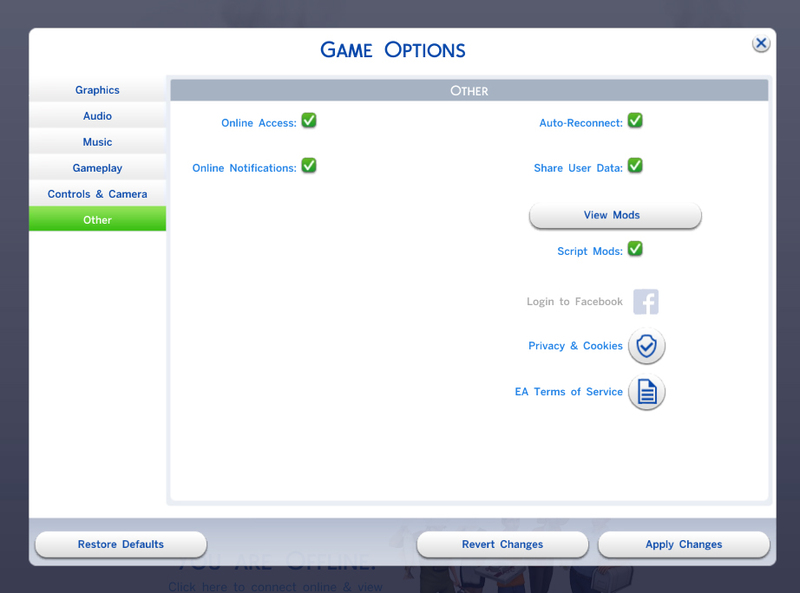 If you age a baby up from the crib with this mod installed, the Sim performing the action will pick up the baby. However, when finding they have a child in their arms instead of a toddler, they become unable to do anything with it! I found that just having that Sim go to a dresser and plan outfits (can cancel without any changes) will straighten things out as the lot gets reloaded afterwards. Sims that are allowed to age up naturally from the crib don't get picked up and carried and so they work out how to walk perfectly well on their own. It has been reported that a child who skips toddlerhood can get stuck with skills being leveled as if they were a toddler instead of a child. I haven't seen this occur, but if you encounter it the Simmer reported that the problem was cleared by exiting the game and clearing the cache files. You should probably do a "Save As" into a new save game when doing this just in case. This is a script mod, so extract the TS4SCRIPT file contained in the download file into your mods folder. It can also be placed in a subfolder, but no more than ONE subfolder deep. You must have script mods enabled in your game options in order for this script to run. Every game patch will turn your mods back off, so be sure to turn it back on! This mod is written for use with The Sims 4 version 1.47.49 (November 13, 2018) game patch, it is unlikely to require updating for game patches past that. Due to the way the mod is coded, it should be very stable. The code for this script function hasn't changed in many game patches. If the mod should fail to install itself, or cause an error while running, it will revert back to the original function and the game will silently continue without the mod.